View of “Like, Resembling, Similar,” 2007. Left: Luke Stettner, c,c,e,e,e,e,e,e,e,f,h,h,h,i,i,l,l,m,n,o,o,s,t,v,w, 2007, watercolor on paper, 47 3/4 x 80 1/4“. Right: Luke Stettner, the final word, 2007, two soundproof clear acrylic boxes, cassette recorder, endless loop, cassette tape, and foam, 18 x 17 x 14”. “Like, Resembling, Similar” features the understated work of Christine Frerichs, Ryan McLaughlin, and Luke Stettner, each of whom attempts to recapture emotional states accurately through coolly Conceptual processes—among them a collection of texts scattered by helium balloons and repetitious drawings of a portrait. Methods of representation and translation tie the work together, and so does an undercurrent of mournfulness reminiscent of the work of Felix Gonzalez-Torres. The lone sculpture in the show, a cassette player housed within two soundproof boxes, looms as an unorthodox centerpiece. 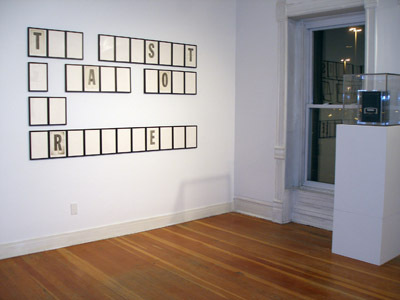 In the final word, 2007, the last word spoken by Stettner’s father is broadcast in a continuous loop, but the sound is suffocated by its own encasement. Stettner chooses not to share this intimate utterance, offering instead an opportunity to reflect on the universality of death. Similarly charged is Mirror / Window, 2006, a grainy gray photograph, marked by a white flash point, originating from an undeveloped roll of film found on Frerichs’s deceased mother’s desk. The artist surprisingly transforms an otherwise dull, forgotten image into a portal that connects with her departed parent. In these works, emotional attachment is quietly and safely locked away, producing a sense of longing and stillness in the viewer. Failure, looming here as the impossibility of avoiding death, is interwoven with the improbability of creating an accurate representation of someone no longer alive. But to its credit, the exhibition exceeds the basic promise of duplication by lacing its cold, clinical approach with a shudder of emotion.